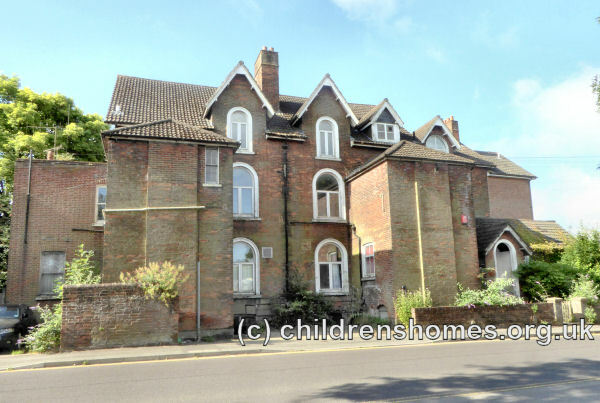 The St Michael's Shelter and Training Home for Friendless Girls was established in 1882 at Endless Street, Salisbury. It was run by a branch of the Ladies' Association for the Care of Friendless Girls, and its object was 'to save young girls from bad surroundings, and rescue the fallen'. The premises could accommodate around 20 girls, normally aged from 16 to 16 years at their date of admission. A charge of 5s. per week was made for each inmate. The girls were given training in laundry work and needlework. By 1897, the establishment no longer catered for 'the fallen' but was a Training Home for girls 'in difficulty or danger'. Inmates were expected to remain in residence for two years. The superintendent was Deaconess E.M. Anderson. Knitting had by then been added to the girls' occupations. On 8th November, 1901, the Home was officially accredited as a Certified School, allowing it to receive girls boarded out by the workhouse authorities. By 1912, the Home's intake was described as being limited to 'respectable girls'. A charge of £12 per annum was made for laundry girls, who were to remain for two years, £13 for house girls, and £15 for workhouse cases. Entrants were required to be provided with an outfit of clothing. The superintendent at this date was Deaconess Hall. In 1937, the Home moved to 28 Churchfields, Salisbury, where its remit was to train 'difficult girls'. On June 21st, 1939, the Home — now occupying 28-29 Churchfields — was certified as an Approved School for Senior Girls. The premises accommodated up to 24 girls, aged 15 or above at their date of admission. The training provided by the School included domestic training and gardening. On 18th March, 1968, management of the School was taken over by Wiltshire County Council. By the early 1970s, the premises had become St Michael's Reception and Assessment Centre. In more recent times, the building housed a children's resource centre. Wiltshire and Swindon Archives, Wiltshire and Swindon History Centre, Cocklebury Road, Chippenham SN15 3QN. Has a few documents relating to the establishment. The National Archives, Kew, Richmond, Surrey, TW9 4DU. Has a few reports including one on the dismissal of the headmistress.